As so many people, I love eating pasta and I love making pasta dishes, like this Pici Pasta with Cabbage, Ham and Pecorino Cheese. I am not so into the making pasta itself; may be one time when I have more time on my hands I will. Lucky me and all of us, there is so much super quality pasta available, fresh and dried, that I will not be running out of choices anytime soon. When I look at my pasta recipes, and believe me, there are many more to come, I divide them into pasta with a creamy sauce, pasta with meat and vegetables, vegetarian pasta. Among those recipes are oldies but goodies, sometimes with a little twist or you’ll find unusual combinations (one day when they are posted you will read them or one day when you come visit me and you will be introduced to my huge collection of recipes). 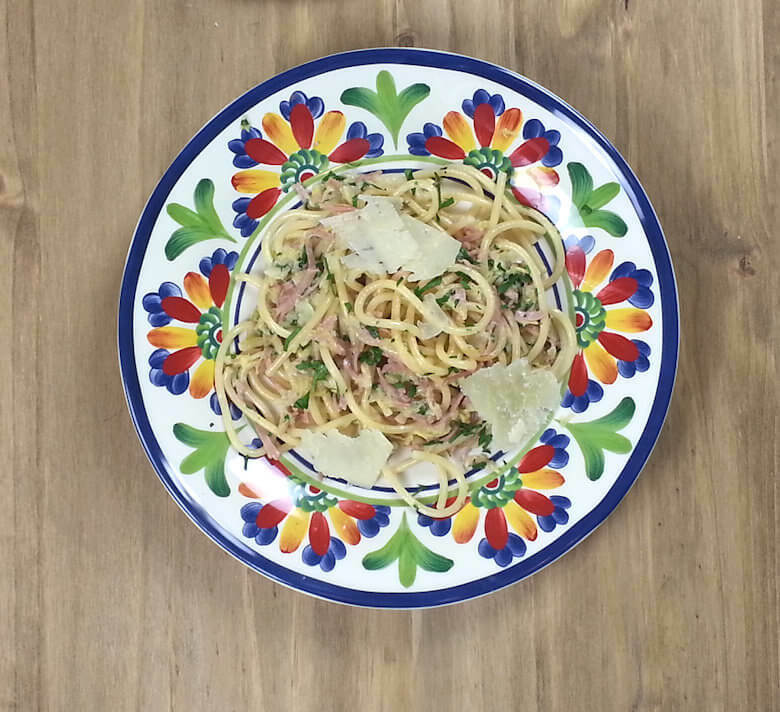 In this particular recipe, I have combined pici pasta with cooked ham, cabbage and Pecorino Toscano cheese – hence the name Pici Pasta with Cabbage, Ham and Pecorino Cheese. 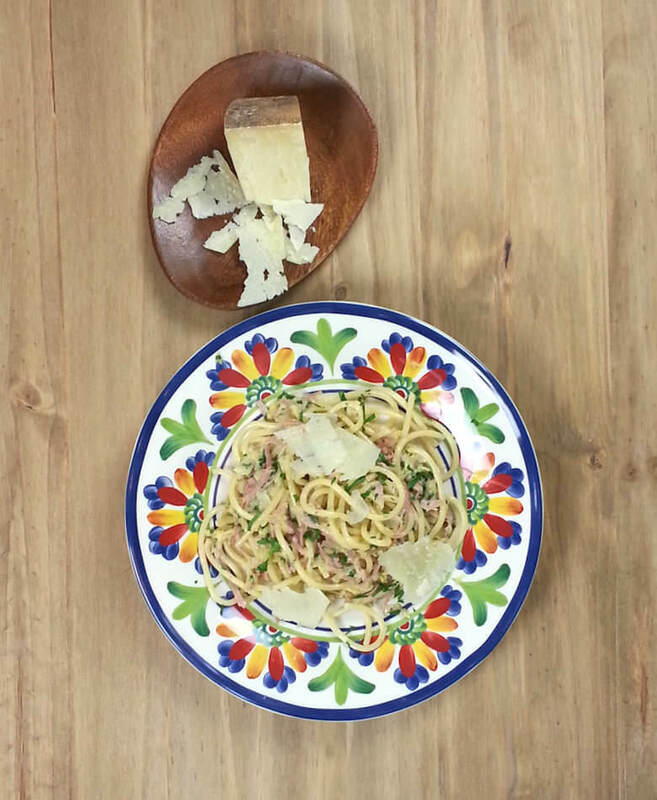 Pici pasta is the pasta choice for this recipe. I once heard somebody say, who wants to eat pici, who wants to wait for his pasta to cook for 15-20 minutes (depending on brand and preferred tenderness). Well, I do, because it is a lovely thick pasta that indeed needs his time to get ready, but the beauty is, you can make the sauce and whatever else you need, while the pasta is cooking and both can be ready at the same time and then it is a matter of blending the 2 together. A similar pasta is bucatini. My sauce or toppings are Napa cabbage, cooked ham and cheese. 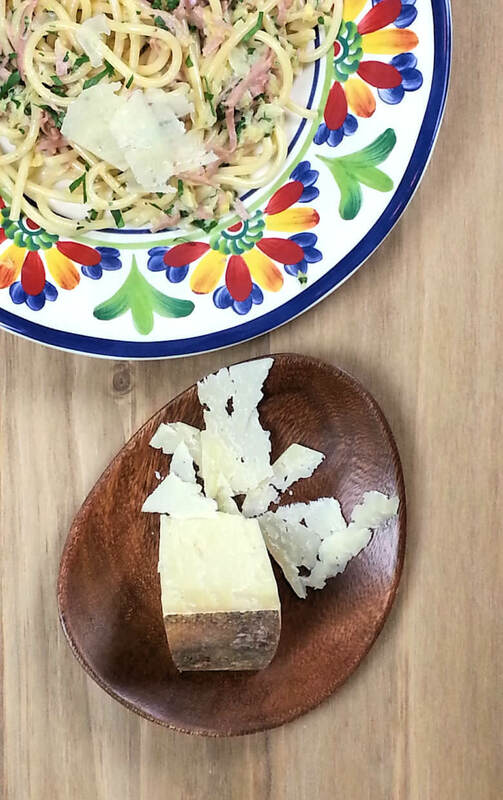 To start with the latter, I used a pecorino; not the usual pecorino romano – that is a very salty and sharp cheese and with the ham that would be overly salty; I picked another Pecorino; Pecorino Toscano Stagionato to be precise. This is also a sheep’s milk cheese, with a mild and nutty flavor. The Pecorino Romano can sometimes be overwhelming in a dish, which would be too much in this recipe. For the meat section of this recipe, I used cooked ham, which is rather salty, so please taste before you add more salt. Of course you have the liberty to use any other ham; a prosciutto or a black forest, but I guess most of them may even be saltier. The vegetable of choice is Napa cabbage; a light and tender cabbage, that does not need much time to cook. I added just a little bit of cream and cheese to tie everything together and the cheeses shavings and parsley added at the last moment make this Pici Pasta with Cabbage, Ham and Pecorino Cheese different. Bring water with salt to a boil and cook the pasta al dente, according to direction on the packaging. Wash shredded Napa cabbage, cut cooked ham in julienne and cut some shavings from cheese and grate rest of cheese. Heat olive oil in a skillet and add garlic, cook until fragrant, about 1 minute. Add ham julienne and cook a 1 minute. Add cabbage, 1/2 teaspoon of salt and pepper. Toss to coat and stir until wilted. Add 1/2 cup of cream and cook, uncovered, a few minutes until cabbage is tender a sauce is reduced and covers cabbage. Drain pasta, reserve 1/2 cup of cooking water. Add pasta to cabbage mixture, add grated cheese and parsley and toss to coat. Add some cooking water if needed. Transfer to plate and garnish with some parsley and cheese shavings.